The long-promised post is out, but not here but at Al Jazeera: Truth and falsifications in Russia. It has also been translated into Russian at Inosmi.ru (Правда и фальсификации в России). Results were made up. The percentages were all written in advance by the Kremlin, and they have nothing to do even with the sum of falsified votes. In this scenario, even a vote for United Russia would have no effect on the final outcome (because the actual voting process and the determination of percentages have no bearing on each other). 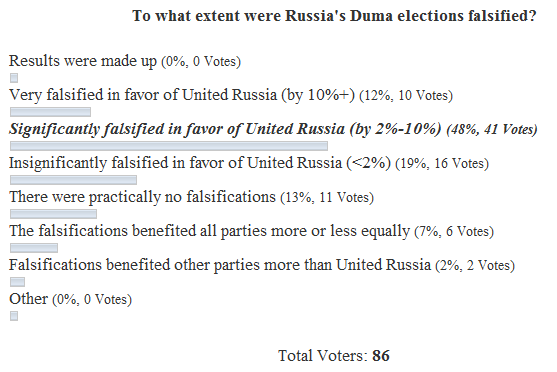 Very falsified in favor of United Russia (by 10%+). That is, by 15%, 25%, etc. But at least the official results were not made up from thin air, as above. 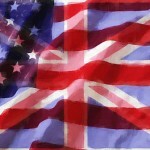 They are the sum of both real votes and (many, many) falsified ones. Furthermore, the proportion of votes between non-UR parties was maintained, only being reduced by a large factor in relation to United Russia. Dmitry Kobak makes a statistical argument for a 15% falsification, although there are counter-arguments that his methods are questionable. This view is held by many of the liberal oppositionists, including those who protested at Bolotskaya last Saturday; among Anglophone Russia watchers, this includes Sean Guillory and my nemesis in this blog’s comments section, peter. 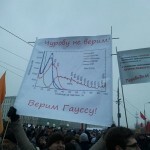 Significantly falsified in favor of United Russia (by 2%-10%). This option would indicate that United Russia got a few percentages more than its real result, i.e. 39%-47%. There are regions of Russia were falsifications happened on a big scale, but they are mostly confined to Moscow and the ethnic minority republics. If your choice is towards the higher end of the scale, i.e. 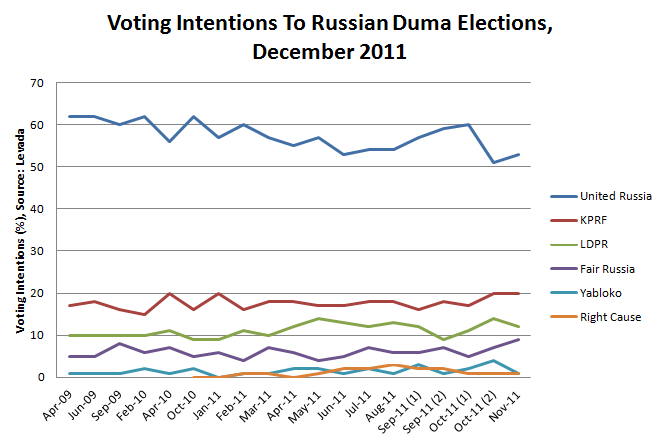 falsified by more than 5%, then United Russia should not have gotten a majority in the next Duma. The strongest concrete evidence for this is the FOM exit poll, the most comprehensive in Russia. I support this viewpoint: my best guess is 5% more for United Russia, but almost certainly less than 10%. So does Alexander Kireev (he thinks it’s a bit less than 10%), and the blogger hist_kai (his statistical analysis puts it at 5-7%). 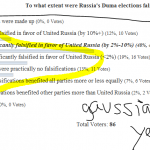 Insignificantly falsified in favor of United Russia (<2%). This means statistically insignificant falsifications – most regions enjoyed clean elections, with significant falsifications observed only in a few of them. Evidence in support of this version includes all pre-election polls and the VCIOM exit polls. There were practically no falsifications. The Kremlin’s line. The falsifications benefited all parties more or less equally. 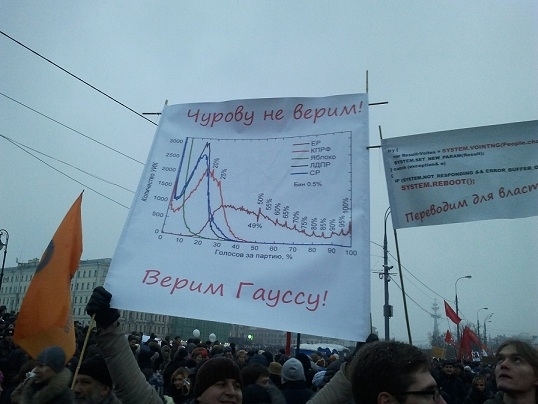 There is statistical, exit poll (in St-Petersburg), and anecdotal evidence that parties other than United Russia also slightly benefited from fraud – mostly, the Communists and Fair Russia (it is generally agreed that Yabloko got screwed by everyone). But did they benefit AS MUCH AS United Russia from fraud? That is another question. 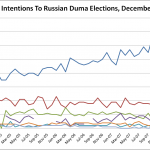 Falsifications benefited other parties more than United Russia. Poor United Russia, not only are the elections rigged against it but it gets blamed for it! Other. I think I’ve pretty much covered all possible opinions, but you never know so this is here for anybody who has a radically idiosyncratic interpretation. PS. For any lingering skeptics, more evidence in addition to what I presented in the Al Jazeera article that Moscow’s elections were highly falsified: stations with electronic voting machines (which are hard to mess with) reported 30.0% for United Russia, in stark contrast to the 46.6% average for the city.